Efforts are ongoing to reunite stolen car parts to their owners after a large haul was found hidden in bushes. A total of 16 catalytic converters were found by PCSOs in shrubbery in Watling Street, Dunstable, last Wednesday. The find follows a dramatic increase in the amount of catalytic converters being stolen from motorists across the county. In the past four months thieves have stripped 72 vehicles for the part. 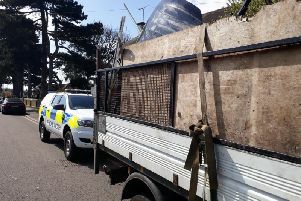 Sgt Linda Wilson said: “This is a significant haul of stolen cat converters and we are now trying to trace the owners. The spate of thefts mirrors previous reports of Vauxhall Corsas and Zafiras being stripped for parts by thieves. A number of vehicles parked in driveways across Dunstable and Luton were first targeted in early 2014, with police investigations leading to a number of arrests. However last Wednesday a post on the ‘Spotted Dunstable’ Facebook page claimed that an elderly couple in Totternhoe had fallen victim to the same crime. Pictures show the front bumper of a car missing, exposing the vehicle’s engine. In January three motorists in Luton, Chalton and Goldington (near Bedford) reported that their Vauxhall cars had been stripped of a number of parts in an identical manner. Between April 2014 and this March Beds Police recorded a total of 93 catalytic converters stolen across the county. This is compared with 214 stolen in the previous 12 months and 356 the year before that. > Anyone with any information should call police on 101, text 07786 200 011, or Crimestoppers, anonymously, on 0800 555111.